Hot on the heels of yesterday’s official announcement from Cardiff City that they are closing their new £12m Ninian Stand in light of extremely poor ticket sales for the 2015/16 Championship campaign, SCFC2 can exclusively reveal the real reason behind the decision. It has been an extremely tough 12 months for Cardiff on and off the field. Our Premier League dream turned into a nightmare and after a season of struggle in the Championship, hard decisions had to be made. The truth is simply that we can’t fill Cardiff City stadium and with the lure of Premier League football down the road in Swansea we have seen out fan base shrink considerably as people choose to spend their hard earned cash supporting Wales’ only Premier League football club. The bottom line is we need the money. With Swansea looking to expand their stadium and with us needing to downsize ours, it made sense to pick up the phone and speak to the powers at be at Swansea. Discussions about the stadium expansion at the Liberty have progressed significantly over the last few months and we have been in regular covert discussions with Cardiff City about acquiring their Ninian Stand to satisfy the growing demand for tickets to watch the Swans – especially from the CF postcode region. Given Cardiff’s precarious financial position, we felt it made perfect commercial sense to utilise the engineering work done in building the stand to aid our own expansion whilst assisting Cardiff with their financial difficulties. Sadly neither party would provide any details on the actual timeframes involved in the removal of the Ninian Stand from Cardiff City Stadium to the Liberty Stadium. Although after some investigative work we were able to establish that Tates Crane Hire had already been sounded out about the transportation of the 5,300 seat stand the 40 odd miles down the M4 to Landore. One thing for sure though is that whenever the move happens we think it’ll see the biggest police convoy on the M4 since the Swans last bubble trip to Grangetown! All Cardiff City season ticket holders who have already purchased 2015-16 seats in the Ninian Stand will be personally contacted to discuss moving seats and if they wish they can upgrade their Season Ticket to be a Swansea City season ticket instead. 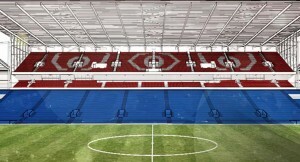 SCFC2 welcome the news of this ‘quick stadium expansion fix’ but really hope that the silly head slapping seats are removed and replaced with suitable swim away seats instead. Ha ha nearly fooled,could you just ponder the thought of all those red and white,ho,sorry,blue and white scarves heading west on the m4?? Hey, you cheeky Jack… Did make me laugh though… We’ve become used to being laughed at.. You can have our stand if you want, for nothing!!! Just send us over Hew Jenkins.. We’ll even pay the crane costs, and we’ll throw in V. T. For free..!!! Haha – I’m glad you’ve taken our April Fool’s prank in the right way 🙂 As for VT – you can keep him thank you very much! Phil, you shouldn’t set our heights so high… We’ll be lucky to survive league 2 with these clowns in charge….